I want to start this month out by talking about a snack favorite this month that just crept its way in the last week and a half, that is sour blue raspberry popcorn. This is something that they make at a local popcorn shop and I have been way too into it, I don’t usually like sour but I love this and I love that it turns your tongue blue because I am eternally a child at heart. 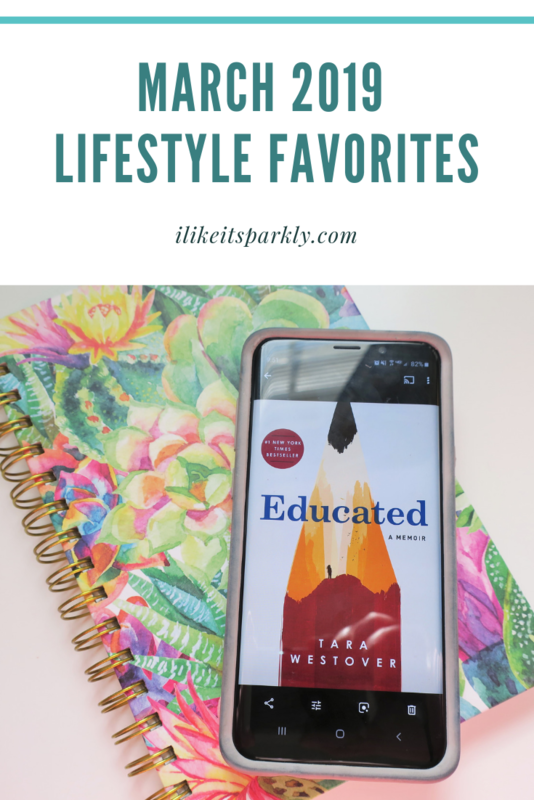 I’ve started talking about my favorite book that I’ve read in the past month in these, so I have to share that this months favorite was for sure Educated. I don’t know what it was exactly but I loved this, I just found it so interesting. This was also my pick for the month for my husband and I to read because I felt like I was seeing this everywhere and couldn’t miss out on reading this one. A terrible favorite it Mercari, and by terrible I mean it’s terrible for my wallet but I have still been loving using this app as it’s super easy to sell things while also being really fun to shop on, which I think it a little bit of the problem, but either way I have been enjoying it a lot. RuPauls Drag Race has been a favorite as well, it always is because I love watching it, however, I must admit that I am not obsessing over any of the queens this season, not yet anyway as it is still early on, but either way, I have been enjoying it a lot. Another TV favorite that is always a favorite is Bob’s Burgers. I love this one so much I almost feel like I shouldn’t mention it, but I did because I am really into it as always. I just think it’s a fantastic show and it’s my favorite happy place show. Decluttering has been a serious favorite in my life recently, I have been going through everything and organizing it, it has been so fun though I still feel like I could declutter a lot of areas of my life. Okay, mostly beauty related things, bath things and clothes but I have made a good dent in all of these things and am working to see what I actually use and what I can use up, but decluttering and spring cleaning have been in my life majorly this past month and probably will be this upcoming month. The last favorite that I want to talk about this month is baths because I have been loving taking baths, I always have kind of enjoyed it but I have been loving it an extra lot this month, it’s just been really peaceful and I hope to continue on with taking all of the baths. 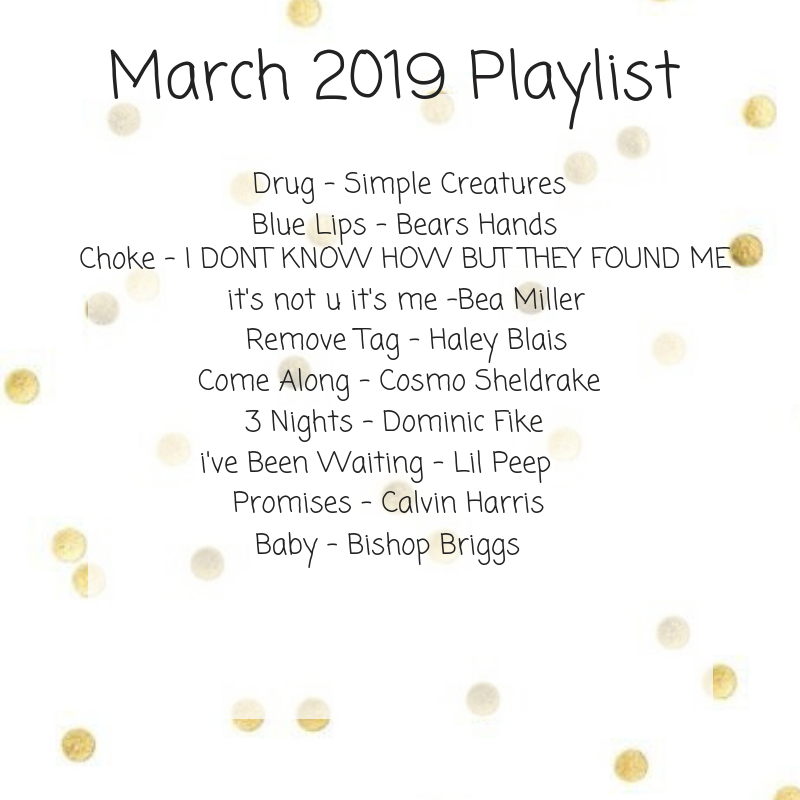 My playlist this month is really fun and is mostly new things to me, I have been trying to listen to some new music because I feel like I haven’t done that in a while and I really like it. So, if you guys have any music suggestions for me feel free to drop them in the comments below. That has been everything that I have been loving during the month of March, a really random mix though all are things that I really love. I feel like March was really relaxing and really chill, so I think my favorites have kind of reflected that in things that are relaxing and that I already know I loved. What are some of your current favorite snacks?